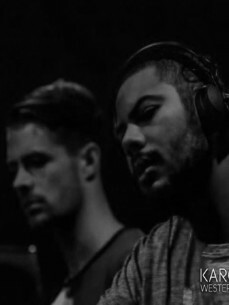 RAAF & ABSURD is the recent coming together of Raven Verhoef and Abdelkarim El Hantali, two talented DJs from the Netherlands. They first met at a DJ contest three years ago, but it was after playing together at an afterparty that they saw their stylistic stars aligned. As such, since then they have been perfecting their common ground; distilling their own respective influences into one new and unique sound. As it goes, said influences are mainly each other and the club; the crowds they play to and the faces they see peering back at them. Years of playing and partying in clubs means the pair have enjoyed experiences across the whole dance spectrum, from house to techno via all the deeper stuff in between. Their focus is on raw deep house, music with texture and feeling as much as a purposeful drive. “We always like to surprise crowds with our energetic approach” they say. Hear their DJ exploits over the year. RAAF & ABSURD have played the likes of Windmill, Cookie Club and Midnight Freaks at club AIR. Besides they are regularly seen at Studio 80, Club UP and the Chicago Social Club, on nights such as Black Box, Voidd, New Babylon, PLAK, BENDE and Nachtdivisie.